The British summer wouldn’t be complete without a bowl of fresh strawberries and cream! Picking your own strawberries ensures you can enjoy your favourite variety of fruit at its most fresh. 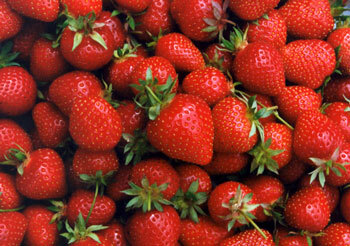 A good strawberry can be enjoyed on its own or in home-made ice cream, sorbet and summer desserts. Check out the recipes for more ideas. Strawberries also make great jam, but take care when freezing. Taste is a very personal thing. Flavour can vary with such factors as weather and the stage of the crop, and so our map and staff will direct you to the crops that are best on the day you visit. Some varieties have better keeping qualities than others and so it’s best to ask the advice of our staff if you need to keep the fruit for a special function and not eat them straight away. Elsanta (early and mid-season) – our first crop to fruit this year. Elsanta has a very ‘strawberry shape’ and a long shelf-life, and so is often found in the supermarkets. Hapil (mid) – an outstanding flavour and a distinctive shape. Hapil is exclusive to PYO farms. Florence (mid-late) – a good keeper and, as with Symphony, must be picked fully ripe to enjoy its flavour. Symphony (mid-late) – a lovely looking fruit and keeps well. It needs to be picked fully ripe to appreciate its distinctive flavour. Jam strawberries are on differing fields selected as they become available throughout the season. Please see the map by the farm shop for up-to-date information at the time of your visit. Make sure you enjoy the best quality fruit – check out our advice on picking and storage. One kilo of strawberries will give 8 small portions, 6 average portions or 4 good portions. There are usually 50 strawberries to the kilo. Strawberries will last a lot longer with the hod (green leafy bit) still in. The best fruit is usually at the furthest corner of a patch of strawberries. Walk to the far corner before starting to pick, if you can resist that far! Washing the fruit is not recommended. Washed fruit goes soggy, and loses its flavour and natural shine.